Wash the fish fillets and dry with paper towels, salt and pepper the fillets, set aside. Put flour, egg and panko bread crumbs in separate plates. Dredge the fish in flour first, then in the egg and finally in the bread crumbs. Heat oil in a pan, pan fry the fillets until cooked, serve with lemon slices and the dill and cream cheese sauce. Mix all the ingredients in the bowl of a small food processor or in a bowl using an immersion blender. This sauce can be made ahead of time as it keeps well refrigerated for up to three days. Tastes like fish. Nice sauce. 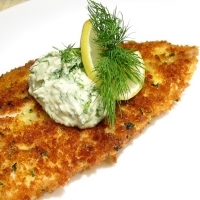 See Panko Crusted Fish With Dill And Cream Cheese Sauce for more. I ended up using Greek yogurt for the sauce and it was fabulous. 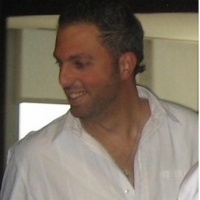 Like BMikel's recipes? Never miss an upload!